The late music legend’s hometown of Gainesville dedicated his boyhood neighborhood park in his honor during a ceremony on what would have been his 68th birthday. 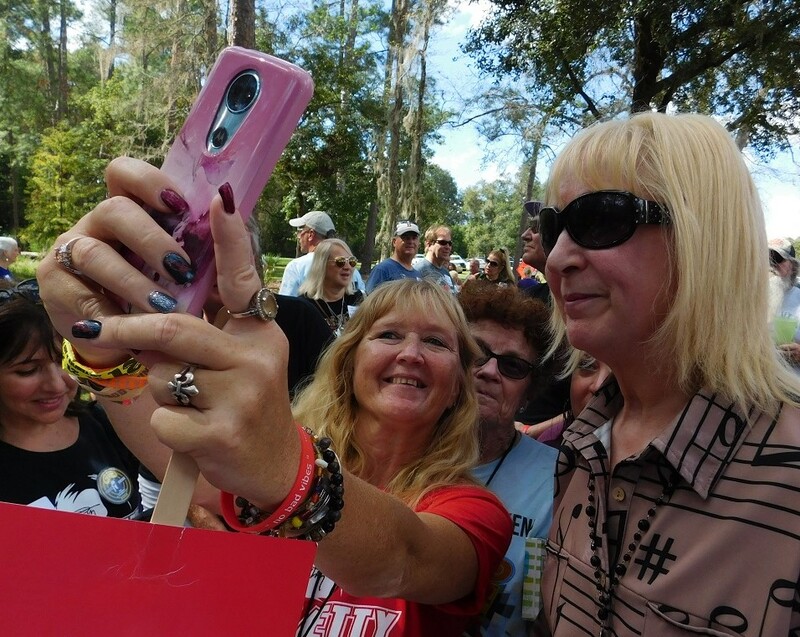 In the shade of the tall pines and oaks where Tom Petty played as a youngster in the 1950s, hundreds of the late rock star’s fans joined his family and friends on Saturday to rename a 22-acre city park in his honor. The Petty boys grew up in a middle-class home at 1715 NE 6th Terrace, just a few hundred yards from where the dedication ceremony took place. 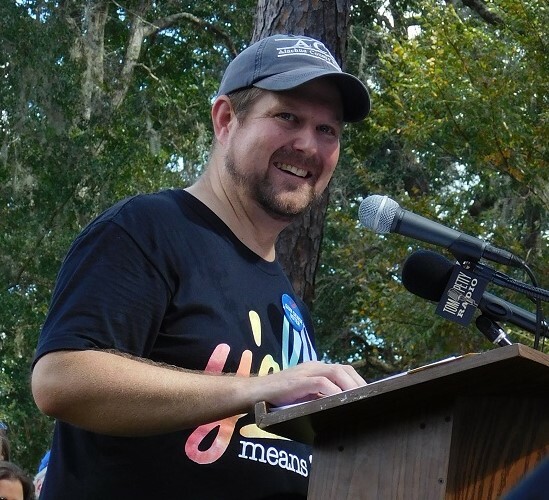 Tom Petty’s lifelong friend, Keith Harben, said renaming the park in the rock and roll legend’s memory is a fitting gesture by the City of Gainesville. “It means now we have a place people can come that’s sort of a mecca where Tom Petty had his footprints all over,” said Harben, who was among the first to suggest the idea and then played a key role in organizing the dedication ceremony. Gainesville mayor Lauren Poe opened the ceremony with brief remarks, recalling the sadness the city felt upon learning the news of Tom Petty’s death on Oct. 2, 2017. “His music was everywhere in the air wherever you went for weeks,” said Poe, adding that city officials immediately began soliciting ideas on how to best honor Petty, including a statue. Northeast Park, at 400 NE 16th Ave., was Petty’s playground as a child before he became consumed by music and, later, rose to rock and roll stardom with Tom Petty and the Heartbreakers. According to Harben, the park was just woods when he and Petty were young boys. It was Harben’s father, Frank, who petitioned the city for the land to become a park rather than the site for a school. By the time the boys entered kindergarten at nearby Sidney Lanier School, the neighborhood woods had become Northeast Park. 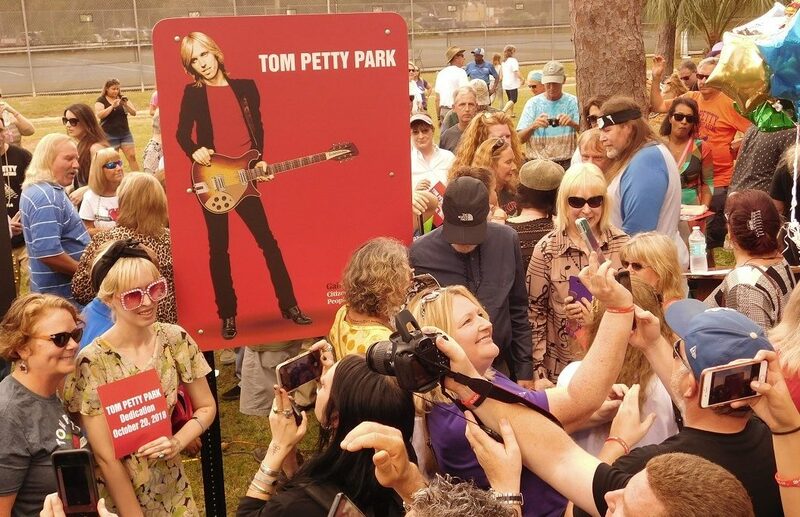 More than 60 years later, the city oasis with ball fields, tennis courts, picnic shelters, trails and a dog park is now officially known as Tom Petty Park. Hundreds of members of Tom Petty Nation, the official Tom Petty fan club that has more than 33,000 members worldwide, attended the dedication ceremony. Many of them were in Gainesville for the first time attending music festivals at Heartwood Soundstage and Depot Park celebrating Petty’s birthday. Sharon Smith, a member of Tom Petty Nation, flew in from Denver to enjoy a full schedule of Tom Petty-related festivities. She gave both Adria Petty and Bruce Petty hugs following the dedication ceremony. 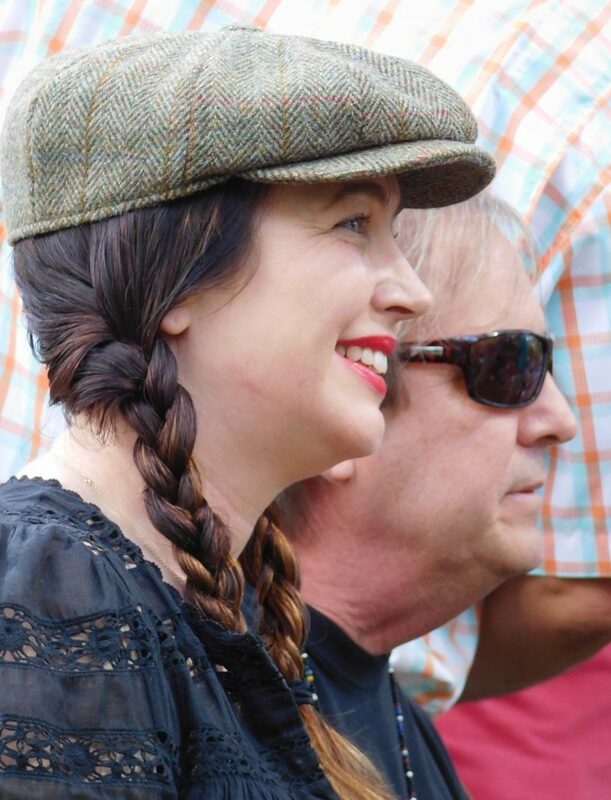 Smith attended her first Tom Petty concert with a friend in 2001 at Red Rocks Amphitheatre outside Denver. She was immediately hooked. “When I saw his beautiful blue eyes — they just sparkled — I had to rush the stage,” she said. “I left my friend in the dust! 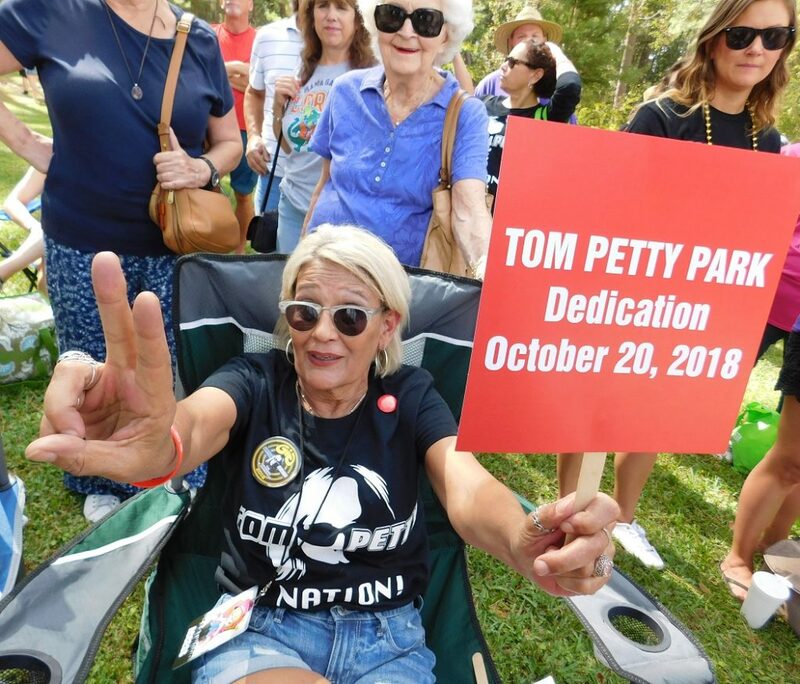 Another Tom Petty Nation member, Mary Beth DuPree of Waco, Texas, attended the park dedication ceremony with her friend, Valentina Sawyer of Orlando. 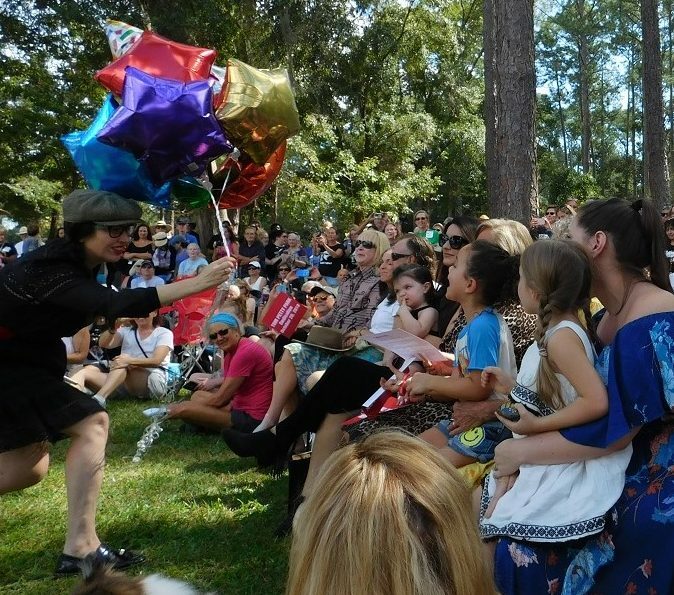 Poe said it was serendipitous that Tom Petty’s birthday and the park dedication ceremony was taking place on the same day as the Gainesville Pride celebration downtown. Poe said Petty was among the earliest musicians to stand up for transgender rights. In fact, his last tour with the Heartbreakers in 2017 included a tribute to transgender actress Alexis Arquette, who died from HIV-related complications a year earlier. “There are so many people in the world whose lives are better for what you did,” Poe said, looking skyward.